We are about productivity for the machine shop. Here are some links to applications that will save time and money. Inplot is an interactive editor for CNC programs. A great help for programmers making changes in existing programs. Make edits and verify at the same time. 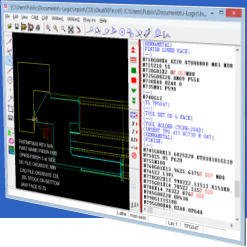 Display toolpaths, tools, part drawing, and program text all at the same time. Step through program, shift, rotate, find tool tangent points, change format, find run time, print, in both lathe and mill formats. Supports rotary tables. Special features for working with Twin Turret lathes. Our IMS Font software is a True Type Font that can be used to create geometric tolerancing symbols for use in any word processor, database or software that supports True Type Fonts. 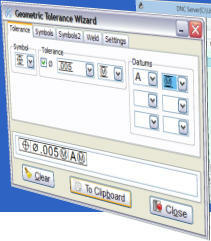 Included is the Geometric Tolerance Wizard for making geometric tolerancing and characteristic symbols and inserting them into documents. Our software for Gage Crib Control and Calibration. With user configurable database. Software for printing out tool lists and setup sheets from extracted data in the text of the CNC program. Now you don't have to create and maintain a separate sheet of tool list information and instructions. You can keep all that data in the NC program itself.